Home » News, Press & Articles » Posts » What Are the Different Types of Picket Fencing? What Are the Different Types of Picket Fencing? When thinking about what you want the outside of your home to look like, the possibilities are endless. Landscaping, lawn ornaments, and fences are all ways to enhance the appearance of your lawn. But how do you decide which to choose? We’ve all imagined having a house with a little wooden picket fence, but that vision may not fit into your aesthetic once you actually have a house; fortunately, there are different types of picket fencing and different picket fencing materials to choose from. Keep on reading to learn the difference between the different options and to learn which one is right for you. A picket fence is a traditional style, produced from wooden pales attached to a rail, and with gaps left between. Any type of picket fence is the perfect option to protect your yard or to mark out boundaries while still allowing light to pass through. Picket fences are a common choice for residential areas and gardens since they blend in so flawlessly and don’t completely obstruct your view—they allow for privacy while still maintaining an appealing aesthetic. Wood picket fences are a versatile option that can give your yard a rustic vibe or can be a little more formal if painted. You can achieve mainstream contemporary designs with this type of picket fencing as well—the options are endless. You can achieve a similar look to wooden fences when you choose vinyl picket fencing. The main advantage to this type of fencing is the durability and wide array of designs. With a decorative appeal and suitable to all types of front yards and backyards, many vinyl fences also meet IRC pool codes. 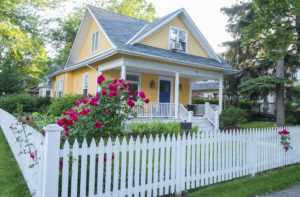 Get all of the perks of a typical fence but with an added flair when you choose an ornamental picket fence. These types of fences can be made out of wood, iron, or a variety of other materials, and they have a more decorative appeal to them. Definitely not as casual as a plain wooden picket fence, ornamental fencing is the ideal option for those looking for something a little extra. If your Toronto home is in need of fencing services, just call Total Fence Inc. We offer a wide array of fencing options that can be customized to fit your specific needs. From commercial fencing to residential fencing and even decks and custom carpentry, we do it all. You can rest assured that our professional staff will use the highest-grade materials and ensure your home improvement projects get done right. Call us today for more information.